I would like to return to a subject that I have often spoken about before. The subject is the Supergrid. Those who are familiar with my history over the past eight years will know that I consider this issue to be one of the most important. What I had not realized until very recently is just how relevant the Supergrid is right now. By its very nature it is going to take some time to construct the Supergrid. There are many elements of it which have to be thought out. We have seen in the U.K. over the past five or six years a concerted policy of building offshore wind. Over the years I have engaged in many debates with people who thought the Supergrid was a luxury. Something we could do at our leisure at a later time. With pressure coming on, this view is now beginning to get profoundly challenged. Britain is trying to build thirty thousand megawatts in the sea by 2020. The people planning the build programme thought that the additional MWs could simply be attached to a slightly modified existing onshore grid. What emerged from this thinking was an extraordinary collection of cables jutting out into the North Sea and the Irish Sea, almost like the bristles on a hedgehog. What those who planned this extension of the current order seemed to forget was that there required to be built an enormous onshore grid to conduct the power from where it is landed to where the people would consume it. Britain would thereby face into a large build programme of overhead power lines running inwards to the cities of Manchester, Birmingham and running southward to the large conurbation that is London. Anybody who has tried to build the grid onshore in the past twenty years will realize that it is virtually impossible to do. We have seen power lines objected to everywhere we look in Germany, in Ireland, in the US and indeed in every developed country. In Germany it is extremely difficult to get power from the old East Germany into the Rhur and it is equally difficult to get power from a wind congested North Germany down to a green hungry Munich area. We have seen it take years to develop the Beauly Denny line in Scotland. It can be pointed out that the Beauly Denny line was merely an upgrade of an existing line through an area mainly inhabited by sheep. Anybody who considers that one would be able to construct power lines through a densely populated place like rural England should think again. The process will simply be too displeasing to too many people and should not be attempted. We are after all trying to do something that has never been done in history before and that is to recast in an altogether new way how electricity is made and transmitted in England. The solution is actually quite simple and that is to build a new grid in the sea. Even though it is technically new, it can be done without seeking planning permission from anybody apart from the Government, a Government who has already demonstrated strong commitment to offshore wind. 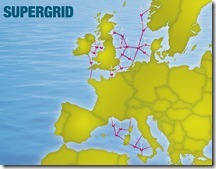 If we were to start building the offshore Supergrid it is merely another small step to connect it up to Germany. This added step would ensure that the cables carrying the power from offshore to onshore would be loaded up from 40% of the time to 90%, on account of the other electricity that would be flowing on the cables. A whole new trading regime would be introduced. The price of power in England would fall because at times the demand for electricity would be met with surplus Germany capacity. At other times German electricity requirements would be met from English surplus capacity. So the transmission cost per unit of electricity would be more than halved. The customer would be the ultimate winner. The price of power would fall. The first thirty thousand megawatts to be built will simply be the precursor and model for Britain becoming a huge exporter of power to green hungry Europe. There is nothing more certain in this world than that the Supergrid will be built. With Europe still in recession and US demand for fossil fuels down 7% on what it was two years go, oil is trading at $85US a barrel. Can anybody imagine or speculate to what price oil will get when the US returns to 4% annual growth and is shortly thereafter joined by Europe which is on a growth path once more? Contrary to what some sages have argued recently the world is not made of gas and the lifetime of fossil fuels is strictly limited. We really need to get on and plan the Supergrid now. We have to put behind us what was done in the past in another era, an era of oil plenty. 1. Who will own it? 2. How will it be governed? 3. How will it be paid for? 4. Where will it run from/to? 5. How will it be operated? 6. How will it integrate and interface with the existing onshore grids? 7. To what standards will it be built? 8. How will these standards be arrived at? 9. How will the builders of the Supergrid be incentivized? 10. What will the expected rate of return be?